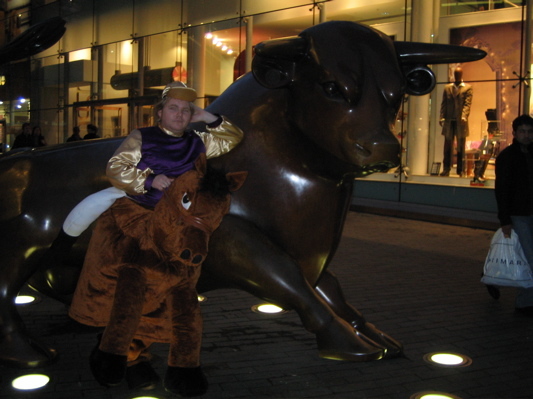 Despite receiving a grand total of no pounds (that’s nothing, you tight-arsed little monkeys) in sponsorship, BiNS entered the third Pantomime Horse Grand National. Meeting the other competitors in the Bacchus bar (now open til 12pm relaxed licensing hours laws fans) at 12, we sipped a pre-race bottle of Nastro Assuro despite the outrageous £3.75 price tag and tucked into some fantastic fish-based snack. Pre-race rituals over with we traipsed up to City Plaza, who were kindly sponsoring the race by letting us change in one of their un-let shop windows. 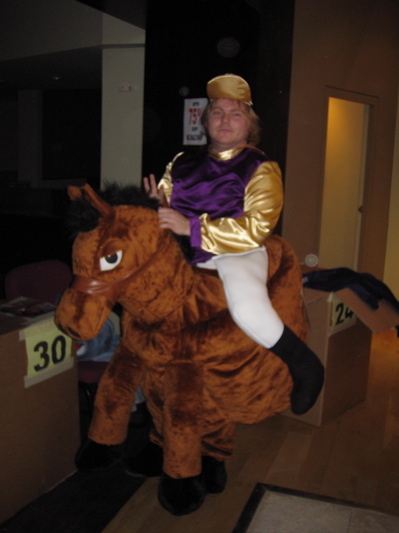 The pantomime horse costumes owed more to Bernie Clifton than anything else, and after squeezing myself into the silks attaching a seemingly never-ending number of false legs I thought I was up and running. Unfortunately I’d put my top on back to front and the cap was made for a five year-old and not my finely coiffured barnet. The 33 competitors were then led a merry dance, down New Street, even out-wierding the Hari Krishna for a change and neigh-ing enough to drown out the sound of the fellas selling the amazing bird whistles. A brief detour up to Marks and Sparks (they didn’t seem to want us in there), and it was up past Brasso and into the Bull Ring (sorry bullringoneword). For once there didn’t seem to be any need for queuing to get on the escalators, and the stony faces on some of the shoppers we trotted past were a joy to behold. I’m truly sorry for disrupting their frantic Christmas retail bulimia. At the course, all the competitors were immediately sobered up by the sheer dangerousness of the fences, or perhaps it might have been the freezing cold and the inordinately long wait before the actual heats began. Heart FM did the event proud, filling in until something actually happened with a vast array of single-entendres and we were all very grateful not to be treated to anything too much off their playlist. It was great to see a load of Brummies out and about suspending disbelief and while we hung around we made a load of new friends, including one completely over-excited Frenchman. Now the race joiners’ pack had promised us the Archbishop of Canterbury, the Archbishop of York and the Lord Mayor, but only the Mayor was in evidence, still I wasn’t too disappointed as we had got to park in the secret underground Council Car Park (it’s not council as in the OTT Christmas lights, white tracksuit exposing ankles smokes Lambert & Butler way – it’s where the Councillors’ park). It’s fantastic, just as you’d have imagined Hitler’s Berlin Bunker with additional silver Daewoos. Ladbrookes were having a field day, tic-ing and tac-ing for all they were worth, we were a slightly disappointing outsider at 25-1, but since we were drawn in heat two we decided that we could study the tactics of the runners in the first race and copy them. 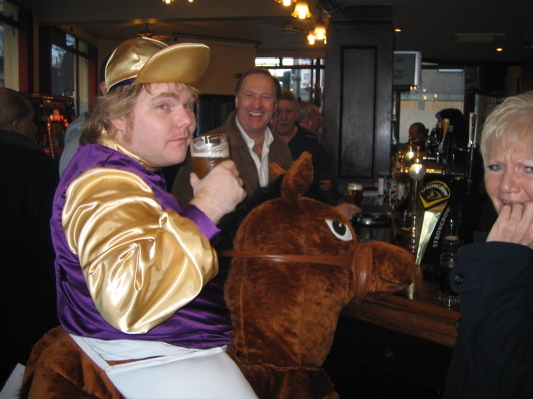 One guy/horse got off to a flyer – Rob Rum – and seemed to be tucking the horse’s head underneath his arm – I thought I would try that. Looking at the course, it also seemed to be well worth getting on the front of the starting grid (is that correct horse-racing terminology? I suspect not, please don’t write in) as the fat arses of the horses were going to prove difficult to get round. After the first heat, the track had to be completely rebuilt, as most runners had decided to go through the jumps rather than over them – a manoeuvre not seen since the 110 metres hurdles was dropped from the paralympics. A nip or two from my hip flask and a longing look over to the Bull Ring Tavern, just think I was waiting to start almost on the spot of one of my most famous sporting triumphs – surely you’ve heard about the time me and my mate Tony stopped on the pool table at the Toreador all night in 1994? 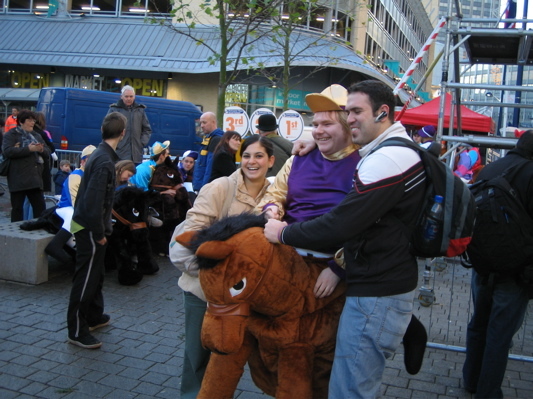 This had its compensations, as last place in the slower heat of the Pantomime Horse Grand National is far more interesting than the tenth or so I might have been capable of – and at least I didn’t have to do it again in the final. Sky News were on hand to interview me as a gallant loser, I managed to look at the camera and only used one expletive in the short time I was on screen (if anyone has taped this I’d love to see if they can ‘bleep’ me out live on air). Still, as the – tardy to say the least – Archbishop would have said, ‘the last shall be first’ and I was, the first across the road into the Bull Ring Tavern. A swift pint or two later I was away, back out to see what was going on, whether they’d got anywhere near staging the final yet. They hadn’t, but the late (not dead) Archbishop of Canterbury had finally turned up. I was overjoyed and looking forward to having a discussion of his view on ordaning half-men-half-horses into the Church of England, but no sooner had he arrived but he was gone. Asking the Archbishop of York, “where’s His Grace f**cked off to?” didn’t seem to be the best answer, so i staggered off for some mulled wine in the German Market and that was that. & that’s that, thanks to all those who supported us (if not financially). It was fun and I’m sure a very worthwhile day out.